I’m now following this blog! I posted the Painter Mommy button on my sidebar! It would be fun to put this up in our little kids’ room (shared by our three little ones). They have an animal theme with their bedding, but could use some extra fun on their walls. 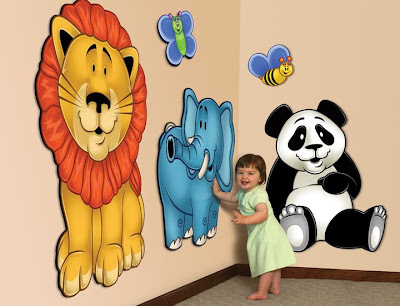 We are redecorating my sons room in an animal theme and these are PERFECT! These are really awesome! I would love to win them for my 5 month old son, Dietrich. We moved into this house in August and he was born in September, so we had just enough time to get his crib set up, but his walls are pretty bare (still). The theme of his bedding is jungle animals, so these zoo animals would fit in perfectly!! They are so adorable and I would definitely love to win. I would love to put this in my son’s room. This would be for my children’s room. I know they would love the bright colors. I love these! I rent and it would be such a great way to decorate my baby’s room, because they are removable. These would be for my baby due at the end of March! I would love these to redo my daughter’s bedroom. I wold love these for my girls! We just moved from CA to MI and this would be a great way to uplift their spirits! I’d love to win this for my five year old daughter. The walls in her room are bare and the murals would really jazz her room up! Thanks for the chance to win. I would love to win these for my step daughter. She is due in April and these would look so cute in the nursery. Thank you for the give a way. I tweeted @Infantbows Would love to win! I would love to win the Wallsy wall mural pieces for my great-nephew’s nursery. He was born on January 27, 2009 and I know his Mom would love these darling mural pieces for his room. Great giveaway! I recently teamed up with some other homeschooling families to co-op. To make a long story short, I offered to have all the preschoolers at my house for the morning while some others took care of schooling the older ones. This mural would be ideal and come at the perfect time. I´m trying to set up a little area that would be fun and attractive for the little ones to do their school/play activities. Thanks for the chance to win and for introducing such a wonderful concept in murals. I subscribed here for an additional entry. I also subscribed over at Painter Mommy Blog for an additional entry. It’s a fun way to bring color to a room. I’d love to win this and donate it to the school I work for. The student would love it! Posted your giveaway on twitter. That’s a Safari in a BIG way. We are currently working on decorating my son’s room and these would be so perfect and fun. Thanks for the great giveaway. I’d love to win this for my son because we rent our house right now so his walls are kinda bare. This would be perfect! I’d love to win this for my daughter’s room! We live in an apartment and can’t paint the walls 🙁 So her room could definitely use this! I would love to win this for my granddaughter’s room. They both would absolutely love these and I think it would help them sleep better in their room with the animals watching over them. Wow! How cute! This would be for my playroom for my nieces and nephews, when I babysit. I would LOVE these in my nursery/kids room! I have been trying to make it jungly in there but these would be INCREDIBLE! Wow, these are great. Thanks for the opportunity!! suhweet! My kids would love this in their play area! or bedroom! I subscribed to both blogs, put your button on my sidebar and blogged about your giveaway! So, I think you can count me in…a few times! I would gift them to my nephew and his toddler daughter. They are very short of money and I’m sure would love something so special for their child. Thanks. My son has a safari themed room so this would be a perfect addition! I’d love to win this because my daughter loves animals. She would go crazy for this! I’m so bad at decorating that I haven’t really done anything to her room yet. This would be a great help! I’ve subscribed to Painter Mommy. I would love these for my preschool. It would make the walls very inviting and colorful. Also it would add to teaching the alphabet with helping them with beginning letters of the animals. My husband and I are expecting our first baby in February. 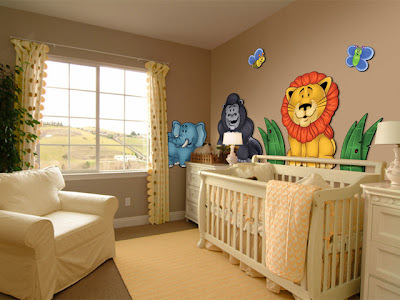 We would love to be able to decorate his or her nursery with these adorable wallsy tales murals. I would also use them later for my child care business in my home and it would be a great addition to the classroom.